A magnitude-6.1 earthquake has rattled Japan's southern islands but no tsunami warning was issued, the Japan Meteorological Agency said. There were no immediate reports of casualties or damage to property from the quake. 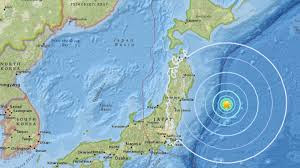 The seismic centre of the quake at 1:35pm on Tuesday (4.35pm AEDT) was off Yonaguni island near Taiwan about 1900 kilometres south-west of Tokyo, according to the agency. The quake struck at a depth of about 30 kilometres. In early September, a magnitude-6.7 quake rocked the northern island of Hokkaido, leaving 41 people dead and about 740 injured.